To the left side of the Salzach River you will find the Rudolfskai area, Salzburg′s top party-mile as well as some nicely preserved parts of the city walls. During the Thirty Years War, Prince Archbishop Paris Lodron heavily fortified all of Salzburg and built walls and bastions on the Mönchsberg, the Kapuzinerberg and around the city itself. Thereby, he transformed Salzburg into one of the most heavily fortified towns of its days. This included the buildings along the Rudolfskai, which faced the Salzach River and were strongly secured. At the Mozartsteg Bridge, you will see that the walls are interrupted. This site was formally occupied by the Michaelertor Gate, but this gate was removed in 1867. A small marble plate commemorates the gate, the open space now grants access to the Mozartplatz Square. On the building to the right hand side of the passage you can see a Baroque sun dial with a display of the Virgin Mary. On the left hand side is a bus stop and behind it you can see well-preserved parts of the old walls. They allow you to get an idea of the impression the walls must have made to potential intruders when they were still complete. These days, the Rudolfskai once again often reminds visitors of a battle ground. Most of the buildings between Staatsbrücke and Mozartsteg are occupied by pubs (including Irish pubs) and bars and especially on weekends, Rudolfskai is where Salzburg′s youth gathers to get wasted. The bars are generally noisy, loud and full of smoke, but if you want to meet young locals and spend a night out for a bar crawl, Rudolfskai is a good place to make a start. 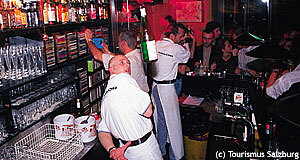 Note also our article on Salzburg's neglectable nightlife.